It would appear that the best Bond films are often those that were produced under the most difficult of circumstances (such was also the case with From Russia With Love). 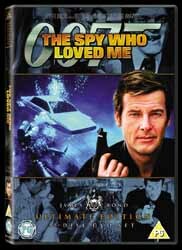 As the special features reveal, a clause in EON's rights agreement with the estate of Ian Fleming meant that only the title - none of the characters or ideas - from the novel The Spy Who Loved Me could be used in the screenplay. (Fleming had all but disowned his poorly-received book, which is why a paperback edition was never published during his lifetime.) The movie's production was further hampered by the departure of co-producer Harry Saltzman, who had run into serious financial difficulties. Filming was also delayed by legal wrangling with the producers of a rival Bond picture (which would eventually make it on to the screen in 1983 as Never Say Never Again) who claimed that the script for Spy used ideas from their story. Fortunately, the enforced delay (the movie premiered three years after the release of The Man with the Golden Gun) enabled the creative team to refine their pre-production - and the result is a movie of great panache and sophistication, and certainly Roger Moore's finest two hours as 007. The notion of a third party stirring up East/West hostilities has been done before, of course, in From Russia With Love and in director Lewis Gilbert's previous Bond outing You Only Live Twice. However, aside from that factor, this is the first wholly original Bond movie plot (penned by Richard Maibaum and Christopher Wood, the latter of whom adapted the screenplay into a very effective novelisation). This plot provides the springboard for some excellent repartee between Bond and his Russian counterpart Anya Amasova (Barbara Bach), while the need to depict a super-tanker colossal enough to swallow up submarines prompts some of the best work that production designer Ken Adam and visual effects supervisor Derek Meddings have ever done. Underscoring visual delights such as the classic opening ski-jump sequence and underwater action involving the submersible Lotus Esprit is a stylish soundtrack by Marvin Hamlisch. Featuring the unforgettable title track "Nobody Does it Better", sung by Carly Simon, Hamlisch's score also adds a catchy disco beat to the chase scenes, yet somehow manages not to sound dated! This film also establishes two new regular supporting characters, with Walter Gotell playing General Gogol, M's opposite number in the KGB, and Geoffrey Keen portraying the Minister of Defence, Frederick Grey. These actors would reprise their roles in every subsequent Bond film up to and including The Living Daylights in 1987. New additions to this Ultimate Edition include vintage location footage in 007 in Egypt and On Location with Ken Adam and a film recording from the original dedication of Pinewood's 007 sound stage, which was specially constructed for the production of this movie. An interview session with Moore filmed at that event is also included, though, as with the Russell Harty interview on the Ultimate Edition of The Man with the Golden Gun, only Moore's answers are presented here, not the interviewer's questions. Both the interview and 007 in Egypt fail to fill a 4:3 aspect ratio television screen, despite being 4:3 themselves. On the plus side, this double-disc edition isn't hampered by the slow loading speeds that affected the previous DVD release of this movie. The Bond makers have rarely done it better. Click on the logo of the desired store below to purchase this item. All prices correct at time of going to press.